Employers paid over $51 billion dollars in 2010 for workers compensation costs, and employees missed a median of nine days due to job related injuries and illnesses. Widely studied after communication and safety failures caused the Chernobyl incident of 1986, a proactive workplace safety cultures is crucial to prevent property damage, risk of injury, and even loss of life. Safety culture focuses on the human factors related to safe workplaces, and it’s closely related to job satisfaction, employee productivity, and an increased return on investment. Safety culture includes the values, attitudes, and actions that affect individual employee behaviors, communication, and group-level decision making about safety systems and adherence. 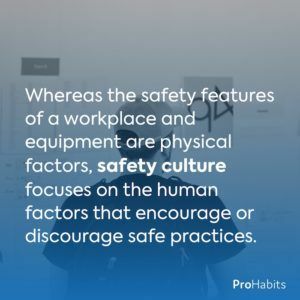 Whereas the safety features of a workplace and equipment are physical factors, safety culture focuses on the human factors that encourage or discourage safe practices. Although cultures can be abstract and difficult to measure, they can be evaluated by observing the actions and attitudes of workers. Imagine a construction site where workers tease each other for wearing hard hats, a factory where safety procedures are ignored for more output or a skyscraper office building where employees haven’t prepared for a safe evacuation in case of fire. Safety cultures aren’t merely determined by the values of leadership. A strong safety culture must be owned and personally valued by every employee and every employee must feel personally responsible for safety. Leadership can encourage safety practices, change mission statements, and promise rewards (or punishments), but it’s ultimately the ownership and culture by every employee that makes the workplace safer. Empower employees with autonomy and encourage them to take responsibility for their own safety and the safety of their team. Rather than have a culture where safety is “following the rules”, create a culture where safety is understood to be a priority for the sake of a larger and deeper purpose. From a human factors perspective, promoting safety for yourself and others is a strong innate motivator. If empowered with ownership, employees’ contributions to the safety culture will make them feel a sense of achievement and accomplishment. Ultimately, the newly empowered safety culture will pay you back as the culture begins to inspire every employee to treat their commitment to safer practices as a personal development initiative. It’s important to understand some of the common failures of weak or broken safety cultures. Although strong safety cultures are correlated with higher employee satisfaction and reduced turnover, some attitudes and behaviors can be counterproductive to safety. A manager focused on profit margin may force a truck driver to stay awake longer and drive while fatigued. Punitive measures or workplace sanctions may prevent employees from reporting accidents or hazardous conditions. 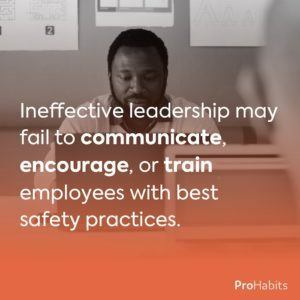 Ineffective leadership may fail to communicate, encourage, or train employees with best safety practices. In all cases, management has the power and responsibility to create a safety culture within an organization. A strong culture of communication and teamwork is essential for safety. Employees should be encouraged, not punished, for reporting incidents and hazardous conditions. Create an employee suggestion program, bulletin board, or email newsletter to focus on safety awareness. 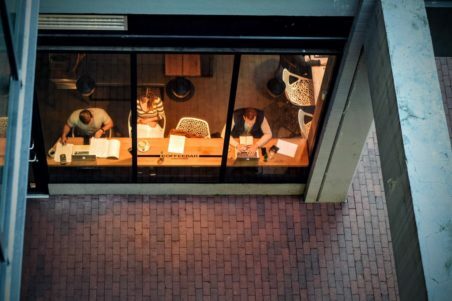 Establish an open dialogue to discuss areas of improvement, ask questions about best practices, and receive valuable feedback from employees at every level. Use regular safety trainings and meetings to review team performance and celebrate a safe workplace. In essence, mindfulness is anti-mindlessness. “Not thinking on the job” and “carelessness” are two of the top three behaviors that cause accidents (Dea & Flin, 2001). If you’ve been a factory or warehouse, you may have seen a sign counting the consecutive days without lost-time incidents. These are examples of physical factors in the workplace aimed at promoting awareness and encouraging conversations about safety. But what about ways to leverage human factors to promote awareness? 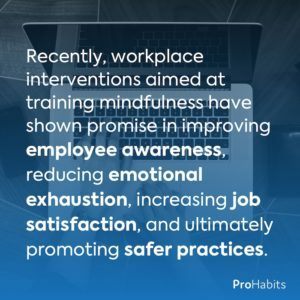 Recently, workplace interventions aimed at training mindfulness have shown promise in improving employee awareness, reducing emotional exhaustion, increasing job satisfaction, and ultimately promoting safer practices. Finally, safety culture can be encouraged with corrections and training for best practices. While it may seem challenging to change safety culture overnight, adopting new processes and explaining the reasoning behind them can demonstrate the value and importance of safe procedures. A case study for hearing protection linked the two most important factors in cultural change: leadership initiative and actionable learning. With open communication and empowered responsibility, leadership can establish safe habits to reduce human risk factors and promote a proactive safety culture.